Home / Screening / Experience A 30th Anniversary Screening Of 'Jason Lives' This FridayThe 13th! 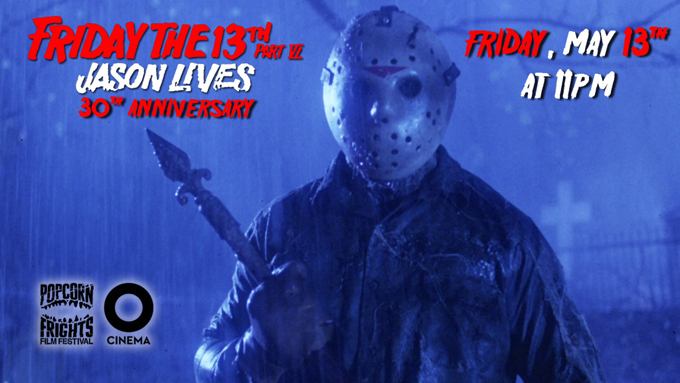 Experience A 30th Anniversary Screening Of 'Jason Lives' This FridayThe 13th! There is a great opportunity to watch one of the most critically received films in the franchise at a theater screening soon and what better way to celebrate Friday The 13th this May this than to see Jason Lives: Friday The 13th Part VI! The film is being shown at O Cinema in Miami, Florida and will have giveaways and classic video game play! The screening is presented by Popcorn Frights Film Festival and there will be giveaways by NECA and an opportunity to play the Nintendo Friday The 13th video game on a retro video game table! Make sure to reserve your tickets now for this exclusive one-night-only event. General Admission is $12.00. General admission tickets are available online and at the door. UPDATE: New Q and A added live via Skype with Jason actor C.J. Graham! If you live in the Miami area, check out this screening of a slasher classic and enjoy some cool giveaways as well.